When founded in 1822, the cemetery grounds were humbler than the miniature city of mausoleums which can be visited today. The main entrance was nothing more than a wrought-iron gate without much decoration, & the area was enclosed by an adobe-cement wall. 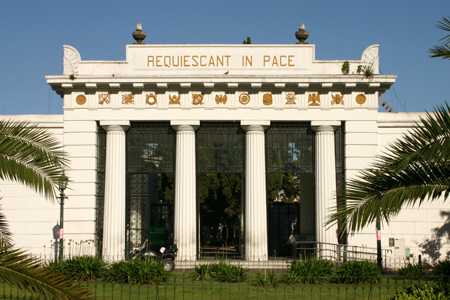 Buenos Aires mayor Torcuato de Alvear sponsored large urban makeovers of the city & Recoleta Cemetery was on his list. In 1881, plots randomly located among dirt paths gave way to orderly sectors & paved walkways. The gate was listed as a National Historic Monument in October 2007.